Ningaloo is the largest fringing coral reef in Australia. It is the largest reef in the world that is found close to a continental land mass, only 100 metres offshore at its nearest point and less than 7 km at its furthest. The park covers more than 4,000 square km and was declared a marine park in 1987. Whales, dolphins, dugongs, manta rays, huge cod or sharks can be seen in abundance at the 260 km-long Ningaloo Reef. Clownfish bathing in anemone tentacles, attractive lionfish or predatory moray eels are just some of hundreds of species of colourful tropical fish that can be seen. The coral reef fish of Ningaloo are among the most colourful and beautifully patterned of all living creatures. They live in and around more than 180 species of coral, ranging from the cabbage corals, brain corals, lavender corals, delicate colourful branching corals, which form gardens in the shallow lagoons. 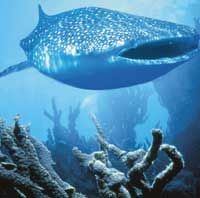 From mid-March to mid-May each year visitors from all around the world converge on Ningaloo for the experience of a lifetime diving with the awesome whale shark, the world’s biggest species of fish. Ningaloo Reef is the only easily accessible place in the world where these giants appear in large numbers at predictable times of the year. Whale sharks reach more than 12 metres long and weigh more than eleven tonnes. You do not even have to be a scuba diver to swim with these massive animals, as they swim close to the surface. Check out the NatureBase site for some images of the magnificent whale sharks. Exmouth or Coral Bay are also perfect places to view the mass coral spawning, a three day event that begins a week or so after the full moon during March and April. Each night, many species of coral simultaneously release millions of bright pink egg and sperm bundles, which float to the surface of the water, creating a floating slick of coral spawn. Ningaloo Marine Park is about 1,200 km north of Perth. The park stretches for some 260 km, from Bundegi Reef in Exmouth Gulf around North-West Cape to Amherst Point, south of Coral Bay. The park extends about 10 nautical miles out to sea. 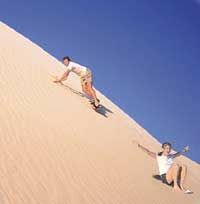 Check out our listing of Ningaloo accommodation and Coral Coast accommodation. In addition to our listed online travel guide information, contact the local tourism visitor centre for your destination for more attractions, tours, local maps and other information. This 4WD 7-day adventure will have you enjoying Ningaloo Reef, Shark Bay, the dolphins at Monkey Mia, Coral Bay, Kalbarri and the Pinnacles. Swim, snorkel, scuba, ride a quad bike or take a boat cruise. The tour is accommodated on sheep stations, farms and country lodges. • • Department of Conservation and Land Management (CALM), follow the National Parks and Others Places link to Marine Parks: Ningaloo Marine Park. • Join the fight to protect this wilderness for all time, save Ningaloo.